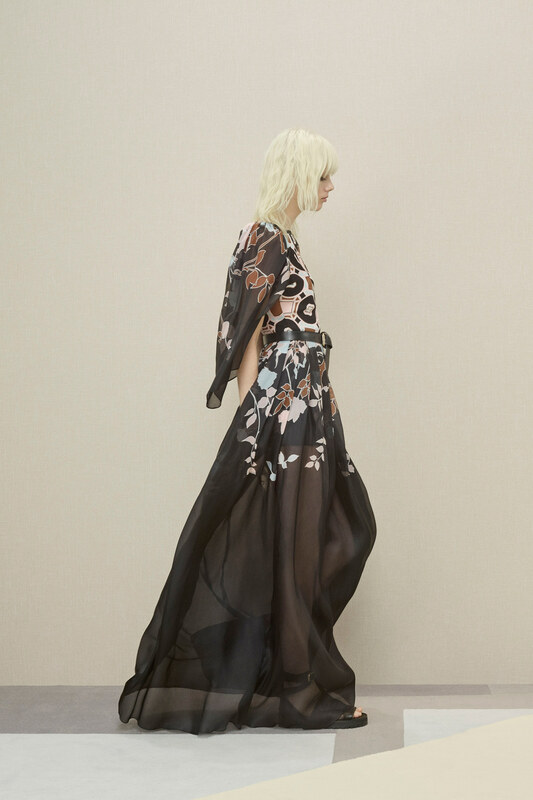 Known for some of the most exquisite red carpet finery and glorious couture collections, Elie Saab brings that same ethos of fairy tale glory to his pre fall collection. Opulence, low level and verging on over the top, is ever-present in a relatively small (typical for pre-fall and resort collections) yet impactful assembly of frocks and coats meant for evening affairs and glamorous moments. Black is a major player, with the occasional peppy color peppered throughout for good measure. As per usual, a delight for the senses! It isn't about the silhouette, but rather THE LACE! Nice to have an option to the usual gown patrol. Pair with Manolos, Giuseppe Zanotti, or Louboutin. 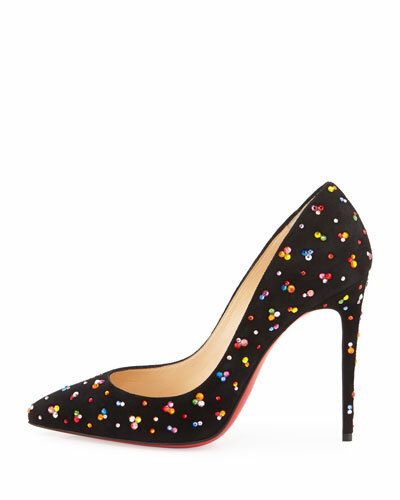 This shoe by CHRISTIAN LOUBOUTIN was MORE spellbinding in person needless to say…..(care of Neiman Marcus). More of the slip is a dress is a slip. Pair with the outstanding miles long jacquard coat below. My personal favorite of the collection. The perfect antidote for opening night OMG-what-shall-I-wear frenzy. Just throw this over anything, tuxedo pants and a ruffled blouse, ball gown of any variety, or a sequined Saint Laurent mini! All purpose. Another pragmatic option for nighttime festivities or fancy luncheons. A short bedazzled jacket in black is an easy way to glam up a daytime ensemble, including skinny jeans and shoe booties. As for the lace slim fit pants, you gotta have moxie in abundance to pull those off. 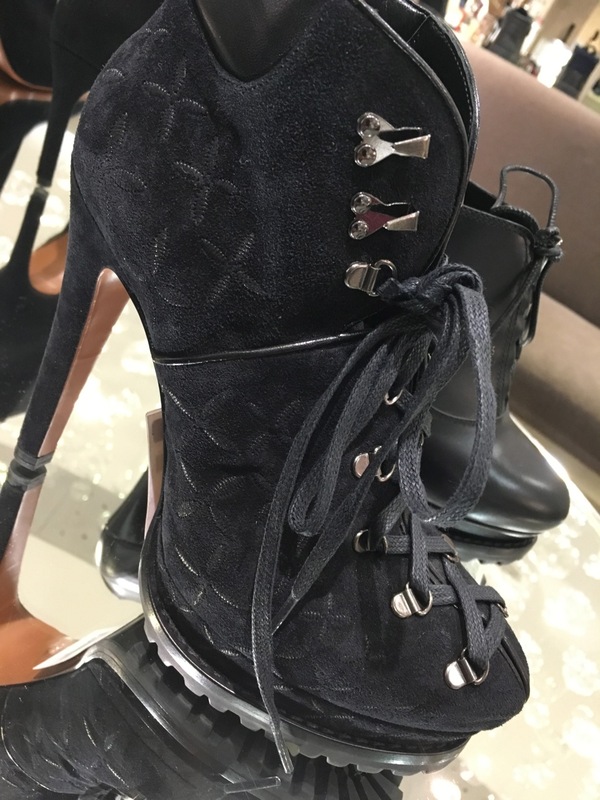 I am OBSESSED with these too cool for school ALAIA shoe booties. Just high enough to be rockin' but not the vertigo inducing level we sometimes see with Alaia. (Currently at Saks Fifth Avenue). This kind of shoe can add upscale funk to feminine sequined frocks and coats which are typically paired with bedazzled pumps and stilettos. So refreshing after all the black, like a poppy sprouting up during the spring thaw. And the green boots with the fanciful embroidery are a zesty standout of the collection. And the 70's influence continues……personally I can stand only so much fringe…a little goes a LONG way. Too much and I get a hive. But, if you're going to do fringe, go the way of Burberry, Valentino, and Saab. Might as well reap the benefits of solid craftsmanship. When leather and mini are desired, this is the way to go! A subdued green leather which looks to be glove soft, masquerading as guipure lace. Cloque and lace, tried and true favorites in the festive frock brigade. Light and yet sumptuous. The leather belt makes everything less serioso. Ok, YUM, quite the airy confection, like a melon sherbet, and yet ornate upon closer inspection. Another favorite, the fitted jacquard peplum top with dramatic bell sleeves over slim trousers and over the knee fringe embellished suede boots. A latter day swashbuckler! Lace certainly looms large in this collection, and is always a smart way to add much visual interest WITHOUT bells, whistles, and irksome weight. When its time to dance the night away, much easier without 20 pounds of armor. KABOOM! To have heads swiveling on the steps and carpets of any glittery affair. (The fox bit is separate thank heavens). Check out the trunk show on Moda Operandi, where you can order the pieces (and the BOOTS) for delivery in several months!